However the Irish Farmers’ Association said the proposals “still represent unacceptable cuts for thousands of Irish farmers”. MINISTER FOR AGRICULTURE, Food and the Marine, Simon Coveney, today welcomed what he described as a “very helpful step forward” in the Common Agricultural Policy reform negotiations. He said EU agriculture ministers broadly supported most proposals tabled by the Irish Presidency relating to distribution of payments. EU agriculture ministers today held a comprehensive discussion on a package of proposals tabled by the Irish Presidency dealing with the issue of how to distribute direct payments within member states. The Department of Agriculture said the package aims to give more flexibility to member states as they try to reconcile the need for greater convergence in payments with the need to ensure that any new arrangements are consistent with their individual farming conditions. Speaking today, Coveney said he was pleased that his European counterparts showed a readiness to move forward on the issue of how to distribute direct payments. The department said the overall tenor was “very supportive of the approach adopted by the Presidency”, though in some cases that support was conditional on progress in other areas, or on further improvements to the text. However President of the Irish Farmers’ Association, John Bryan, said the proposals “still represent unacceptable cuts for thousands of Irish farmers”. Bryan said the outcome of today’s meeting “sends a strong message to Commissioner Ciolos demanding flexibility, with some member states insisting they are not prepared to accept the imposition of flat-rate payments, which would be very damaging to production in every part of Ireland”. Coveney said the council also had a “very productive exchange of views” on the issue of the mislabelling of meat products. He said they agreed that the EU-wide nature of the problem required an EU-wide response, and stressed that recent efforts to deal with the controversy would continue. 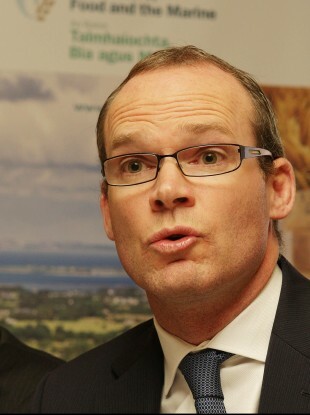 Email “Coveney welcomes 'step forward' in CAP reform negotiations ”. Feedback on “Coveney welcomes 'step forward' in CAP reform negotiations ”.